Posted on November 17, 2016 at 1:13 pm. An artist impression of Crown Sydney on the Barangaroo waterfront. It seems to be one hurdle after the next for the Packer-run Crown Resorts group and their attempt to build Sydney’s second casino in the Barangaroo precinct. The multi-billion-dollar project could be put on hold, or stopped completely, as an inner-Sydney community group formed by residents of the nearby suburb Millers Point has initiated a court battle. Passionate Millers Point residents, who have formed the Millers Point Fund Inc., are arguing the NSW Planning Commission acted illegally by handing over a site which was allocated as a foreshore park to the hands of the Crown Resorts group. Under a concept plan approved in 2007, the space was supposed to be reserved for public use, and the group is alleging the 71-story casino and hotel tower will take up too much of that designated public space. 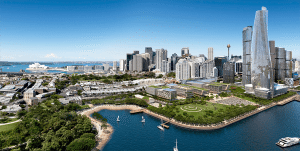 The Barangaroo site has been a constant battleground for residents, developers and government officials since the Crown Sydney casino license was approved in 2013. The initial plan was for the casino to hang over the shorefront, an idea that was scrapped after much public debate, with the new location being set 30 meters from the waterfront in what developers claim allows more public space and a bigger foreshore walk. The case has been lodged in The New South Wales Land and Environment Court, with the Millers Point Fund Inc. being represented by the Environmental Defender’s Office of NSW. They will go head to head against Crown Resorts lawyers, NSW planning minister Rob Stokes, the Lendlease development group and the Barangaroo Delivery Authority, in what the Environment Defence Office chief executive officer Sue Higginson has said is a true David and Goliath situation. The Sydney architectural community has also voiced its dissatisfaction with Crown Sydney’s proposed plan, which includes a six-star VIP casino, 350 hotel rooms and luxury apartments, penthouses, restaurants, bars and high-end retail outlets. If the Millers Point residents can prove the commission acted illegally and win the case, Crown may have to cease work on the construction that’s already underway at the Barangaroo site. Ms Higginson had it right when she compared this to a David and Goliath story. While the Millers Point residents certainly sound like they have a leg to stand on from an environmental perspective, chances are the hot-shot legal team in favour of the casino will find a way around this one. Packer money talks, and it’s hard to imagine construction of the casino ceasing completely. If anything, the case will probably just add further delay to the already heavily contested casino plans. However, Crown is facing a lot of scrutiny at the moment, with the detainment of 18 of its employees in China under suspected gambling crimes and its major poker machine manufacturer facing a lawsuit alleging its machines are rigged. The negative media attention and shaky future with Chinese high rollers could prove detrimental for Crown Sydney’s plans, so there’s a possibility the little guys could still be in with a chance.